Egyptian forces have struck "terrorist training camps" in retaliation for an attack on Coptic Christians, President Abdul Fattah al-Sisi has said. Announcing the strike in a TV speech late on Friday, he promised to "protect our people from the evil". Countries supporting terrorism should be punished, he said, as he appealed to US President Donald Trump for help. 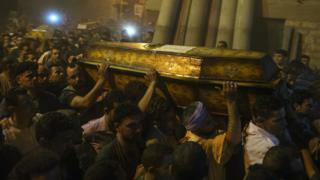 Military sources told Reuters news agency that the militants targeted in Libya had been involved in the attack on Egyptian Christians earlier in the day. Libya is effectively controlled by a large number of armed militias that have emerged in the chaos since Nato-backed forces overthrew long-serving ruler Col Muammar Gaddafi in October 2011. But IS has also built a presence in Libya during the chaos. Egypt has launched air strikes against IS in Libya before. In 2015, the military bombed several sites, also near Derna, after militants released a video showing the beheading of 21 Egyptian Christians. 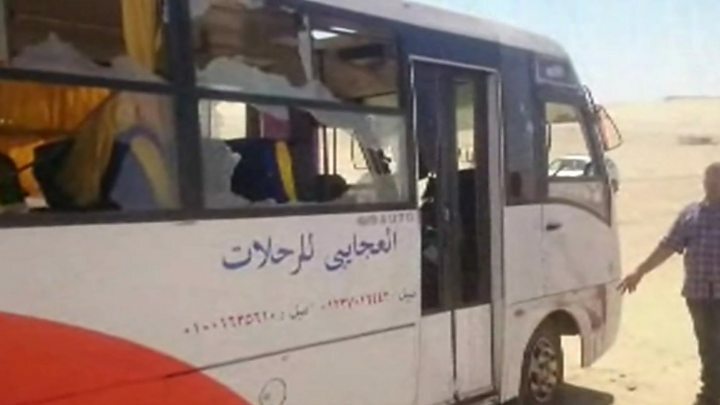 The Copts killed on Friday had been travelling to the Monastery of St Samuel the Confessor, 135km (85 miles) south of Cairo, from Minya province when their bus came under fire. Gunmen wearing military uniforms attacked the convoy with automatic weapons before fleeing in 4X4 vehicles, eyewitnesses said. Minutes after President Sisi's speech, the White House released a statement of support from Mr Trump. "America stands with President Sisi and all the Egyptian people today, and always, as we fight to defeat this common enemy," he added. Those attacks prompted President Sisi to declare a three-month nationwide state of emergency and promise to do whatever was necessary to confront jihadist militants, most of whom are based in northern Sinai.